Gypsies have long been among the most mysterious, and exotic peoples on earth…. Often the subjects of stories told about them and their ways of life, Gypsies have persistently intrigued those of us who envision a rich culture complete with bright, colorful clothing, ornately decorated traveling wagons…moonlit campfires, mesmerizing music and a plethora of exotic smells and sounds. Legend holds that Gypsies are among the world’s greatest storytellers…and especially….. fortune tellers. It is in the spirit of this matchless and mysterious aura of storytellers, craftsman, and mystics that I am so excited to introduce you to The Gypsy Palace Tarot, by Nora Huszka.The Gypsy Palace Tarot is a 78 card Tarot deck of bright colors, engaging, distinctive imagery, symbols and generational stories just waiting to burst forth in all their glory. There’s always something special about self published tarot decks, and The Gypsy Palace Tarot is no exception. As we all know, mass market decks flood the bookstores, metaphysical shops and the interwebs each and every year, some themed, some traditional and some quite abstract….a deck for nearly every taste, one might say! However, self published decks have quality…a certain “je ne sais quoi” that all the other decks cannot quite achieve. 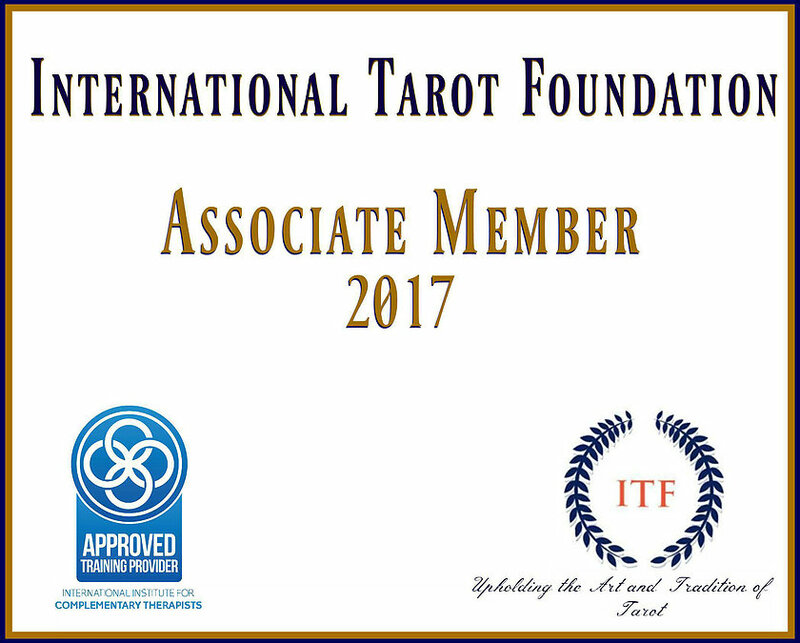 For me, it was a case of love at first sight as I gazed at the unique imagery and potential stories that just waited to unfold and I realized straight away that this deck must become part of my world. The cards are wonderfully sized, at 2 ¾” by 4 ¾, making them perfect for holding and shuffling. The card stock is absolutely ideal and will last for several years to come… the imagery on the backs…slightly reminiscent of the famous turbaned fortune tellers from which we envision upon hearing the word “Gypsy” are completely reversible if you happen to be one of the readers, such as myself, who use reversed card in their readings. 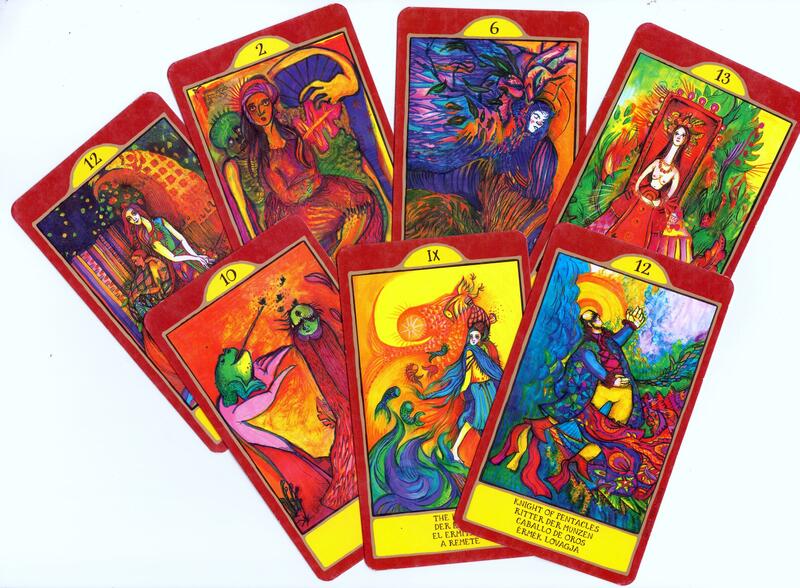 The cards themselves are thinly bordered in a rusty colored red and have a yellow semi circle at the top containing roman numerals for the Major Arcana and regular numbers for all of the Minor Arcana and a the bottom of the cards a rectangular box, also the same sunny yellow, containing the English, German, Spanish and Hungarian name of each individual card. They remind me of ornate picture frames bringing out the stunning detail of the images. On the inside border is an almost gilded looking line encircling the colorful imagery in each of the cards, making the characters simply jump out and demand your attention! Nora’s artistic interpretations have transformed the traditional pictures we normally see on the Rider-Waite style decks into an amazing twist of swirling colors, shapes and intuitive imagery that absolutely pleases the eye and makes for a more intuitive approach, something I’ve been trying to bring out more in my readings. Another thing you may have noticed is that the Court cards are numbered sequentially, making them a continuation of each suit with number designations of 11 for the Pages, 12 for the Knights, 13 for the Queens and 14 designating the Kings. I actually like this style of creating a continuous journey through each suit of the Minors. There is no LWB (little white book) or companion book, although I have heard that it may be available in the not too distant future, but there is, however, a two page leaflet that comes with this gorgeously one of a kind deck, that depicts a unique spread called “The Caravan Spread” consisting of nine cards positioned in, of course, the shape of a Gypsy vardo! Nora also includes a Welcome, describing her deck and it’s uses as an animated game, demonstrating how these cards can be used to spark your imagination and creativity. There are only so many copies printed of this glorious deck, making it a limited addition, so hurry and grab a deck or two before it disappears! I would highly recommend it for all types of readers, beginning and experienced alike. The Gypsy Palace Tarot has quickly become one of my most treasured reading decks, and I encourage each and everyone of you to go take a look, let your creativity unfold as you look at it’s imagery and symbolism. This is a truly awesome deck that will definitely not disappoint!